Bike hire is available from Rothan Cycles at 9 Howmore, Isle of South Uist, HS8 5SH. Tel: 01870 620283. The Heb - Race on the Edge (an accessible multi-discipline Adventure Race Solos and Pairs) will be held on 31 August to 1 September 2019. Participants will be biking, running and kayaking up and down North Uist, Benbecula, South Uist and Eriskay. See photos and latest info on Facebook. Late medieval tower and enclosure located on an island in Loch an Eilean (map grid reference NF 761371), not far from Howmore. Now in ruins, the castle had internal measurements of 3.1 x 3.9 metres, with walls ranging from 1.1 to 1.4 metres thick. Given its size, it was probably used more as a refuge or vantage point or could have been just a status symbol, rather than an actual residence. 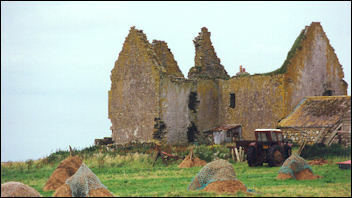 Owned by Ranald Alansoun of Ylandbigrim who also possessed Dun Skaith Castle and other land on Skye around 1505. Ruined chapels dating from 12/13th centuries and burial ground, plus old thatched cottages. The guide books relate that Ormacleit (or Ormaclete) Castle was built for Ailean, chief of the Clan Ranald, over a period of 7 years at the beginning of the 18th century. Unfortunately, it burned down to a shell in 1715 when a side of venison caught fire in the kitchen on the eve of the Battle of Sherriffmuir when the clan chief was killed. Today, quite a lot of the structure remains and it appears to have been a two-storey house with a T-shaped layout rather than a fortification. Over the doorway you can see an armorial panel apparently. About halfway down South Uist, you will see a turn to Bornish (Bornais in Gaelic). Dun Bhulan (on a spur of land overlooking the beach) is an Iron Age broch and settlement (map grid reference NF 714297). There's also a track south from Bornish leading to a standing stone. A team of archaeologists has found a 3000 year old Bronze Age settlement which includes the remains of two human bodies which were buried under the roundhouse floor several hundred years after their death. Could these be mummies? More details from Sheffield University. Local history displays, crafts, cards and cafe. Well worth a visit. Open April to end September. Monday to Saturday 10am - 5pm and Sundays 2pm - 5pm. Tel: 01878 710343. See web site. Half a mile north of Milton, follow the farm track about 200 yards to a cairn on top of a small hill. Flora was born here in 1722. She famously helped Bonnie Prince Charlie in the Jacobite Rebellion. The Askernish golf course was originally laid out in the 19th century by Tom Morris (one of the world's greatest golf course designers). It was expanded from 9 holes to 18 holes in 2008. The William Neill Studio Gallery is worth a visit (tel: 01878 700237). He is a Hebridean wildlife and landscape artist. From here you can access about 20 miles of sandy beach which stretch up the west coast of the island in complete contrast to the hilly east. If you are lucky, you might see seals popping their heads out the water. You are quite likely to see noisy oyster-catchers (black and white birds with long orange beaks). For self catering holidays here, visit 8 Askernish. 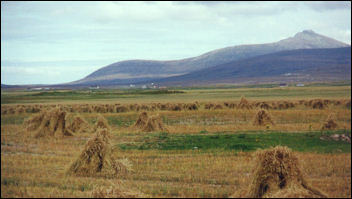 The South Uist Games are held at Askernish in July. Medical centre, supermarket, post office, pub/restaurant & hotel, fish & chips, petrol pumps. Various events take place throughout the year at the community halls. Terminal for the CalMac vehicle ferries from Oban and Mallaig, this is a small village with post office, garage, grocers, public toilets, telephone booth. It is the 'capital' of South Uist. Cycle hire available. The newly improved Lochboisdale Harbour has pontoons and facilities for visiting yachts. Tel: 01878 708012. Beneath the ferry pier are the remains of Stornoway Castle which was the stronghold of the MacLeods of Lewis early in the 16th century. It was destroyed by Cromwell's troops in 1653. Sits on a rocky islet in Loch Boisdale (the sea loch from which the village takes its name). Accessible only by boat. You might see it from the vehicle ferry if you are travelling that way. Small standing stone close to the shore near the Polochar Inn. The Hebridean Woolshed is usually open to visitors most of the time from March to October but check with Denise first by phone 01878 700828. She also runs the Big Garden (the islands' only historic high-walled kitchen garden) where you can buy local produce. A stone causeway from Ludag now links South Uist to the beautiful little island of Eriskay (population approx. 140). Bonnie Prince Charlie's Bay is a gorgeous sandy beach. There are plans to build a heritage centre about the famous Eriskay Pony. The S.S. Politician sank in the Sound of Eriskay in 1941 and its cargo of whisky bottles was 'rescued' by the islanders This true story was later turned into a book by Compton MacKenzie 'Whisky Galore' and a film which was shot mainly on Barra. For more stories, visit Am Politician - Eriskay's only pub. Caledonian Macbrayne operates a small vehicle ferry on the 40-minute crossing between Eriskay and Barra. There are several sailings every day throughout the year. Check timetable online. This collection of 42 stories comprises every type of tale found on the island of South Uist, including heroic Fingalian stories, international folk tales, ghost stories and local historical and humorous anecdotes. John Lorne Campbell`s translations were made directly from tape recordings, and they perfectly convey the terse and vivid expression and of the original Gaelic without losing the natural rhythms of idiomatic English. In the 1890s this island was one of the poorest districts in the Outer Hebrides. Roads were no more than rough tracks. Gaelic was the majority language, although children had to learn their lessons in English and few allowances were made for bilingual teaching. Epidemics were frequent and the school had to close its doors because of outbreaks of smallpox, whooping-cough, scarlet fever, mumps and measels. Rea's memoirs show how he strove to meet these difficulties. Rea went on to become a respected and beloved teacher, and the excitement and wonder of his experiences on the remote island is described in this fascinating book. His pupils recall him as a sincere, hard-working man and an excellent teacher, while he treasured his memories of South Uist for the rest of his life. 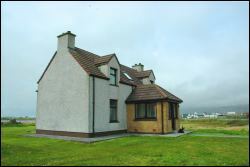 Modern house located near Lochboisdale. Sleeps 6.
and taking trips over to Barra, Eriskay, Harris and Lewis. 3 bedrooms (1 double & 2 twin). All modern facilities and fully heated. Rental prices from £380 per week. Web site includes 360 degree virtual tour. 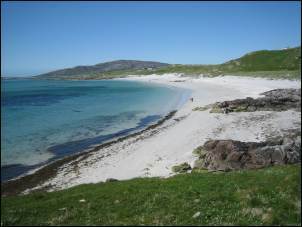 Kilbride Campsite is at Cille Bhr�ghde by the beach. Open April to September - reservation recommended. November to March by prior arrangement. Contact D-J MacIsaac. Tel: 01878 700568 / mob: 07751 251522. 322 North Boisdale is newly refurbished cottage 5 minutes walk from sandy beaches and the island of Orasay. Sleeps 4 - 6 in 2 bedrooms (1 double & 1 twin). 5 Askernish offers self catering for up to 7 people. 4 bedrooms (2 double, 1 twin, 1 single), bathroom, lounge, dining room, kitchen. Close to the Askernish golf course. 3 miles north of Lochboisdale. Tel: 01878 700413. 8 Askernish is a traditional cottage sleeping 4 in 2 bedrooms (1 double, 1 twin). 5 miles from Lochboisdale ferry terminal. Family house in North Boisdale available for self catering with 2 bedrooms (1 double and 1 single), bathroom, modern kitchen, and large living room. Broadband access provided. 6 miles from Lochboisdale (fery terminal). Carrick is a cottage sleeping 5 in 3 bedrooms on the isle of Eriskay. The Gatliffe Trust hostel at Howmore on South Uist has 13 beds and is open all year. No advance bookings accepted. Grogarry Lodge is a sporting lodge let weekly, on an exclusive use and fully inclusive basis, for groups of up to 16 people. Sporting activities on the estate include fishing, stalking, shooting. Seann Taigh is a 2 bedroom thatched cottage originally built around 1875, and now renovated inside to provide self catering accommodation. South Uist Cottages - choice of 3 self catering properties at North Boisdale. Wireless Cottage B&B is near the ferry terminal in Lochboisdale. 2 bedrooms. Contact Mary Jefferson. Tel: 01878 700660.